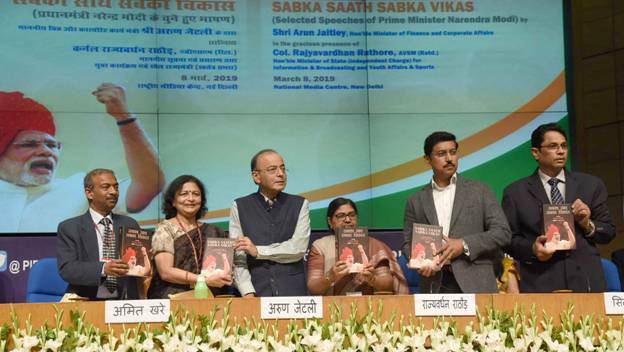 New Delhi: “Sabka Saath Sabka Vikas”, a compilation of selected speeches of Hon’ble Prime Minister Shri Narendra Modi, was released by Shri Arun Jaitley, Union Minister of Finance and Corporate Affairs today in a function organized by Ministry of Information & Broadcasting at National Media Centre, New Delhi. Col. Rajyavardhan Rathore, Union Minister of State (Independent Charge) for Information & Broadcasting and Youth Affairs & Sports graced the occasion. Shri Arun Jaitley highlighted that the Prime Minister has a good grip over a wide bandwidth of subjects including political history, economy, foreign policy, strategic issues, among others. He appreciated the innate ability of the Prime Minister of being a quick learner coupled with clarity of thinking, which together ensure delivery of flawless speeches by him. Shri Jaitley added that the speeches of the Prime Minister have left a lasting impact not only on the country, but all over the world. He also recalled a few great orators from India’s recent history including Mahatma Gandhi, Shri Atal Bihari Vajpayee, Shri Jagjivan Ram and Shri Indrajit Gupta, whose speeches are etched in the memory and consciousness of the country. Col. Rajyavardhan Rathore said that the speeches of the Prime Minister are a repository of practical solutions which are inspired by his simple, down to earth and connected to roots lifestyle. He added the simple language with which the Prime Minister shares his thoughts with people further deepens the connect he has with masses. 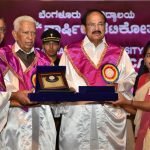 Covering a broad range of topics, his speeches reflect the policies of the Government and the dedication to reach out to people in all corners of the country. 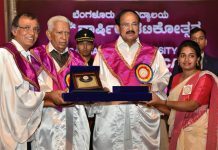 He termed these five volumes as encyclopedia for young students, researchers, academicians and journalists alike. On the occasion of International Women’s Day, Col. Rathore saluted the role played by women, adding that the women have a unique capacity to be both innately gentle and simultaneously fiercely strong. Shri Amit Khare highlighted the role played by Shri Kanchan Gupta in editing the five volumes. He added that the speeches of Prime Minister contained in these volumes carry the message of positivity and hope for a brighter future for the country. He also appreciated the efforts put in by Dr. Sadhana Rout, Director General, Publications Division, Ms. Vasudha Gupta, Addl. Director General, Publications Division and their team in Publications Division for their tireless effort in bringing out these five volumes. 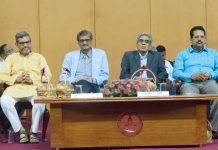 Several Secretaries of Government of India, senior officials of Ministry of I&B and Media Units under the Ministry were also present on the occasion. 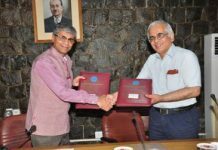 Spanning five volumes, the books, brought out by Publications Division, Ministry of Information & Broadcasting, have been released in Hindi as well as English. Each of these volumes is categorized in five segments, covering Prime Minister’s Ideas on Good Governance; making India competent and efficient; hailing our bravehearts, annadata farmers and brilliant scientists; taking along people on an inclusive path of growth and hope; and sharing the message of a resurgent India with international community. The books reflect the vision of the Prime Minister of seeing all citizens of the country as one and taking everyone along on the path of inclusive development.